While not a lot of panels have been announced for San Diego Comic Con, my off-site adventures for the week are starting to take shape and involve my fifth trip to Hop Con, my fourth trip to Funko Fundays, and my third trip to a taping of Conan. If my good luck continues I will also be attending my second The Loyal Subjects party. Now I just need to figure out what my new experience will be in 2017. 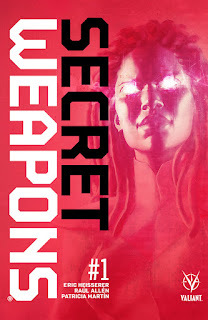 Secret Weapons #1 - I have dipped my toe into the Valiant Comics line a few times and have enjoyed what I read, but I have never been truly hooked before. This issue for Secret Weapons has me hooked and extremely curious about the events that led up to this issue. From what I gather, and feel free to correct me, Harada is one of the main characters who has been finding and grooming Psiots (individuals with powers) for his needs. He had a secret facility called The Willows that housed those who had special powers, but nothing that seemed useful at the time. This site has been destroyed and there is currently someone trying to track down Psiots that won't attract attention if they end up missing. This individual is using an ancient creature that has the ability to absorb Psiot abilities when it soaks in a chamber with the person. This creature has been let loose and is currently hunting a group of heroes with some odd abilities that resulted in their meeting at The Willows. The series will follow the group of Nicole Finch, who can speak to birds, Martin Tyus, who can make inanimate objects grow, and Owen Cho, who can conjure items without any control over when and what he conjures. This group is joined by Livewire, one of the founding members of Unity who actually has a good superpower. She is a technopath and uses her ability to corral the group to figure out what the hell is going on in Oklahoma City. This is an impressive debut issue that more than up to the hype. 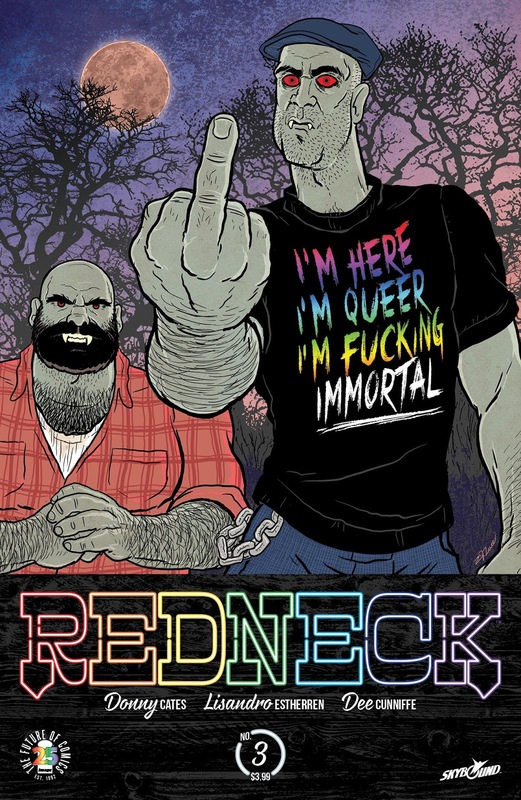 Redneck #3 - This issue featured an amazing pride month variant cover from Ed Luce that is simply amazing and benefits the Trevor Project. They made some t-shirts of the cover as well, but I am not sure that I would feel comfortable wearing it around my kids. Regardless you should go pick up the variant cover edition of this book, check out an up and coming series, and help out an organization that provides crisis intervention and suicide prevention services to LGBTQ+ youth. Issue three is an absolute blood bath and the impending chaos is going to take this book far beyond the vampires trying to lay low and run a BBQ restaurant. The dynamic started to shift with the end of the last issue but it goes completely off the rails in this one. Not for the faint of heart, but a book I can't recommend enough. 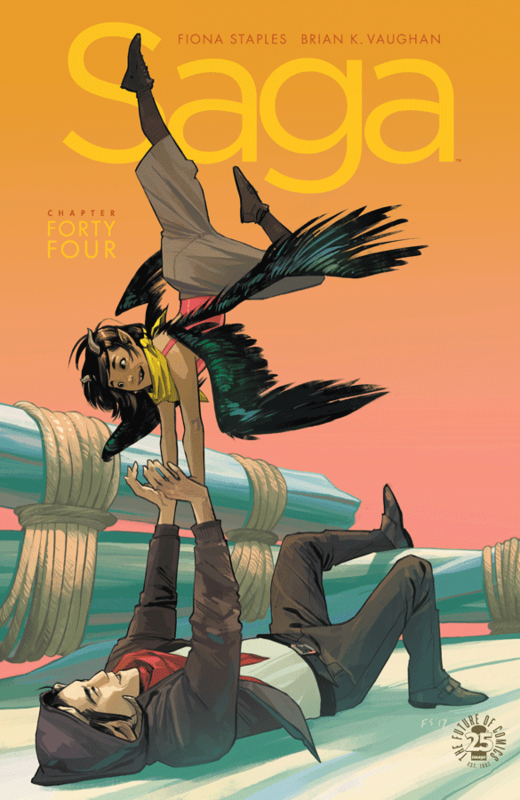 Saga #44 - Alana is still in extreme danger given how her body is responding to her pregnancy. The journey from where the legal abortions are conducted on this planet to where Alana can get one is no easy task. This has been a bit of an odd arc, but one full of Brian K. Vaughan's sense of humor and one in which we really get to see Hazel grow up. I will admit that there are a lot of details in this series that I have forgotten over the years, but the relationship between Marko, Alana, and Hazel remains central and keeps me coming back for more. There are some growing theories on what the ending of this issue means and it was quite surprising, but I think the solution is something simple. 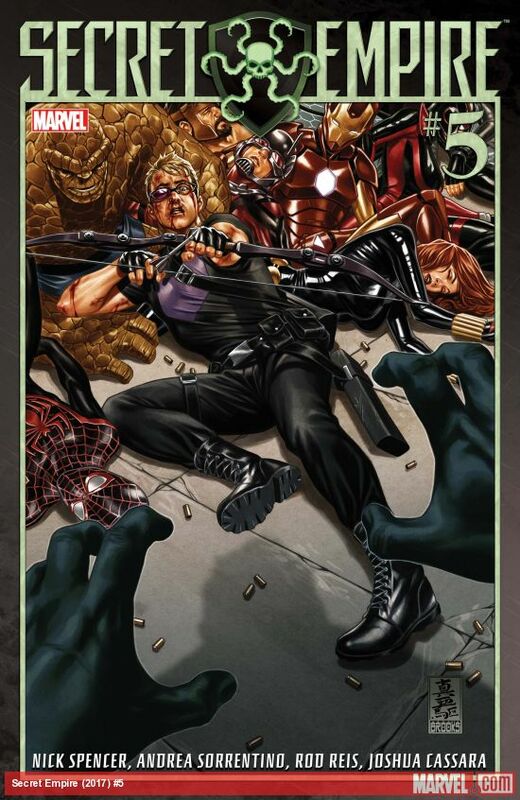 Secret Empire #5 - Marvel's summer event continues to impress as the race for the cosmic cube fragments intensifies. While I have been enjoying the main story line, I am intrigued by what is happening behind the scenes and what the true plan is for taking down Captain America and Hydra. While it is similar to most major comic book events and will likely not really have that big of an impact once it reaches its end, it is extremely well written and I have enjoyed the twist of Captain America as a sleeper agent.